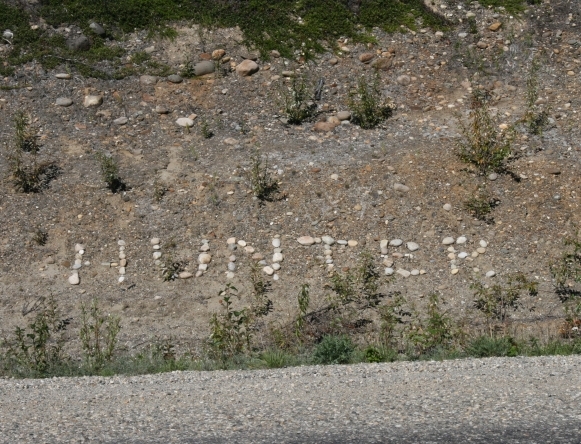 During our recent journey to Alaska, while driving through the Yukon near Watson Lake, I noticed many groupings of stones that spelled out words like “Hunter” in the above photo. The arrangements made me wonder if passersby would think that these stones somehow gathered together by chance through natural forces such as wind, rain, and erosion. Is such a thought preposterous? Of course it is. While it’s true that natural forces can set stones in odd and mystifying arrangements, they never come together in ways that are encoded to communicate. They don’t spell words. Only a fool would believe that these stones came together by chance. And every scientist in the world would assume the same, that an intelligent designer placed these stones exactly where they are in order to spell the word. But wait a minute. What do scientists say about life origins? Strangely enough, many claim that the human body (and every other creature) is the result of the coming together of natural, impersonal forces. The “stones” from which we are built have somehow gathered without intentional design to generate the life forms we have today. Isn’t that preposterous? Our bodies, which are millions of times more complex, filled with far more encoded communication, and interconnected in vastly more intricate ways than is a group of stones that spell “Hunter,” supposedly came about by unintentional, natural forces. No designer was involved. Whether it was wind, rain, sunshine, or some other unnamed force arising from the earth, sea, or air, the human body just happened by a random combination of impersonal chance. Since only a fool would believe that “Hunter” would come together without help from an intelligent designer, what are we to say about those who believe that a far more complex matrix of “stones” came together that way–without a designer, by pure chance? However, we all know our Lord was able to show the blind a complete view of light, so let’s pray that He will continue to. Excellent point! 🙂 I’ve read something similar in “I Don’t Have Enough Faith to Be an Atheist” by Frank Turek and Norman Geisler. It’s a very well-written apologetics book, and one I heartily recommend. This somewhat reminds me of one of the services at a camp I went to at the beginning of the summer. The act wasn’t terribly well staged, but I held the same sort of message that this post does. One of the camp employees pretended to be am evolutionist who had found a strange contraption called a “gonkulator.” (I probably spelled that wrong.) He said that when one first looked at it, it would seem that someone created it, but research led him to believe that the gonkulator was actually a missing link to a car. This sounds preposterous, but it really isn’t terribly different from what atheists believe. What a beautiful illustration! Thank you so much for sharing. And it’s great to have you back! I hope your vacation was a wonderful one. Amen! The creation will always speak of its Creator.